What an amazing looking ride! We’re sure to be right down the road from you. Not far from the heart of Kansas City. This customer wanted his truck looking good, and that’s just what we did. 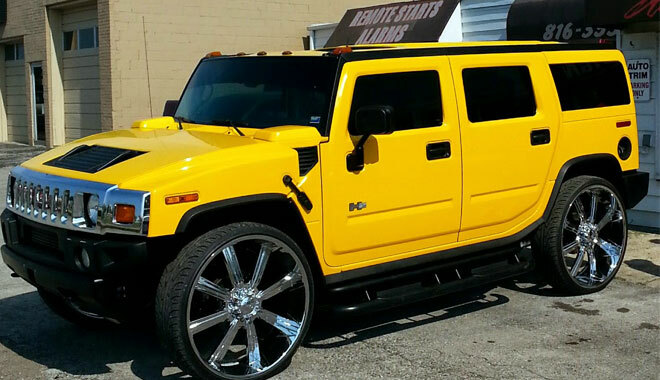 The Hummer H2 along with the window tint was a match made in heaven. The owner was pleasantly surprised at how well everything matched. And this goes without saying how great the tinting looked against those chrome 30 inch wheels! We do all kinds of makes and models. If you’re only doing the front two windows, it takes about 20 minutes or less for installation. Every window tint install comes with a limited lifetime warranty. That means no fading, cracking, peeling, or turning that odd purple color you see on the road sometimes. Our film blocks out 99% of the sun’s UV rays, so you can rest assured you’ll be safe and sound from premature aging and all of the negative effects of the sun. We’re about 15 minutes away from Downtown Kansas City. 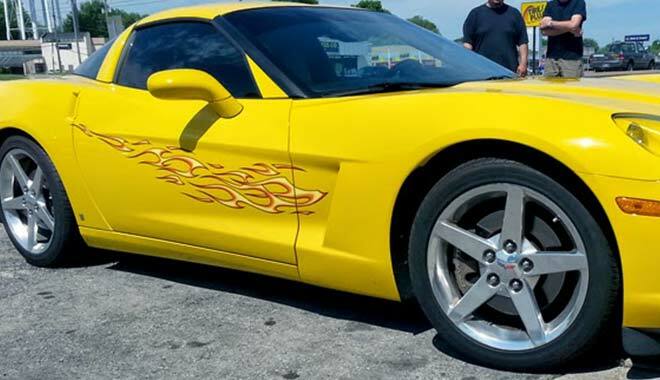 This Corvette was in great shape and the owner has really taken care of this car. What a pleasant installation this was to do. Vinyl graphics usually have a long lifetime, and even more so when you keep your car regularly washed and waxed. We have a variety of vinyl graphics to choose from, and we can also do custom printed ones of your choice. You get expert installation and satisfaction you can count on. If you’re in the Independence or Raytown area, we’d love for you to come see us! Looking for a medium shade of window tint on your car? 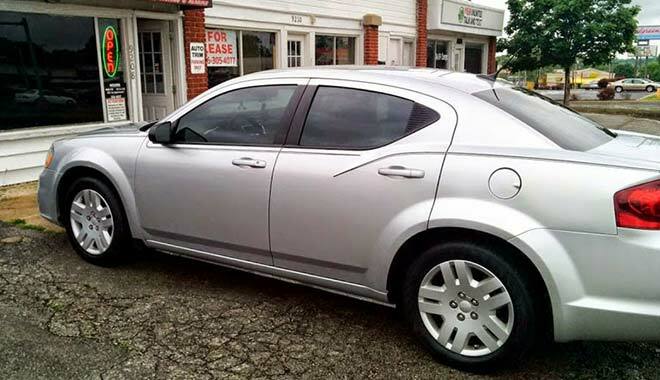 We recommend 35% window tinting on all the sides. It’s a good overall look, is easy on the eyes, and you can see perfectly fine at night with this film. If you live in the state of Kansas 35% on all the side windows and rear is the legal limit. Don’t risk a ticket if you don’t have to, and your installation is guaranteed for life. Come see us in Raytown, Missouri right between Walgreens and Fun House Pizza. Beautiful black Chevy Camaro with gold and white racing stripes—installed right here in Raytown, Missouri. If you’re passing by on your daily drive downtown, or in Independence, we’re a few miles and a phone call away. Rest assured your sports car will also be treated with care and an expert installation. 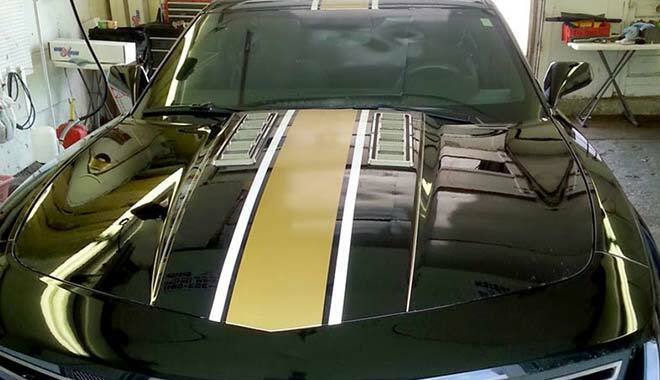 These stripes are sure to make your car stand out on the road. Stop by and see us. Mention this blog post and get 10% off a graphics and vinyl. Freshly installed window tint on a 2014 Nissan Murano. This owner was pleased to hear that all of our work is guaranteed for life. That’s right. If you ever have an issue whatsoever, you’re covered as long as you own your vehicle. We use only the highest quality solar control window films guaranteed not to peel, fade, crack, or bubble. 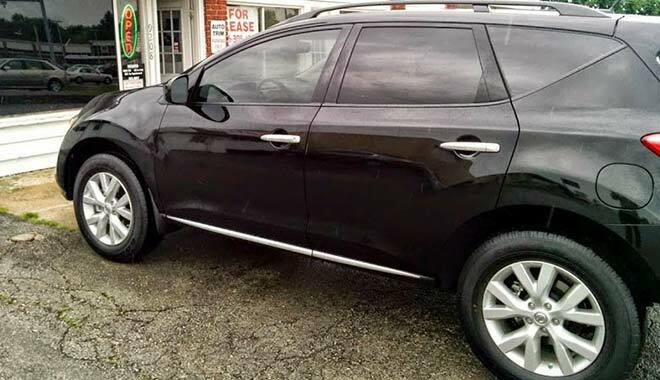 This Nissan Murano has 35% on the front two windows and 20% on the rear half. This is usually dark enough for most people, and you’re sure to notice a difference in the summer, and the winter, as window tint can also cut down on snow glare. We sometimes offer discounts if you decide to get a remote starter installed at the same time. Come by and see us before it gets too cold!